If you are a girl specially from Pakistan and you are using your real photo on your Facebook or any other social networking account then you can be in danger. I have written about this issue in past as well but watching some shocking real cases on TV made me write about this issue once again. as we all know that there are good and bad people everywhere similarly good and bad people are also present in online world. Some bad elements takes girls photos from their Facebook profiles, edits them and then spread those photos on internet. Some bad elements uses those people for bullying those girls. this has even forces many girls to commit suicide. There are also some people who can simply pick up your Facebook photos to use on their websites. Such cases are most common in India, Pakistan and USA. 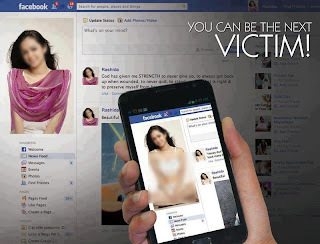 There are dangers of many types online so girls should be careful while Using Facebook and other social sites. they should avoid using their Real pics on these Social networks. Don't share your personal info unnecessarily on internet. Little Carelessness can become big trouble for your life.